[7:54 am] Sarah: We’re on our way to Vimy and I can’t wait to experience such an important Canadian Memorial. [8:10 am] Lloyd: Walking up to the monument in silence, with the structure being slowly uncovered by the fog as we moved closer- there was a definitive feeling of awe, indescribable by words. [8:11 am] Amy: In an instant, only mere metres away, a looming outline of the Vimy memorial came into view. Even though the silence and fog remained constant, I could feel my heart begin to pound in my chest as I slowly climbed the first steps of the monument. [9:12 am] Montaña: Seeing my soldier Acil today dug trenches in the pits of my heart that I cannot see myself mounting any time soon. [9:27 am] Rohan: Though I am no way related to Private Milne, I felt as if he was a close member of my family that I had known for years while I read my poem to him at the Vimy Memorial. [10:18 am] Osose: We’re about to go into the Vimy tunnels and I am very excited to see those. [10:33 am] Bethany: Outside of the Vimy tunnels, I met someone from Chilliwack, my hometown, who heard about my pilgrimage. 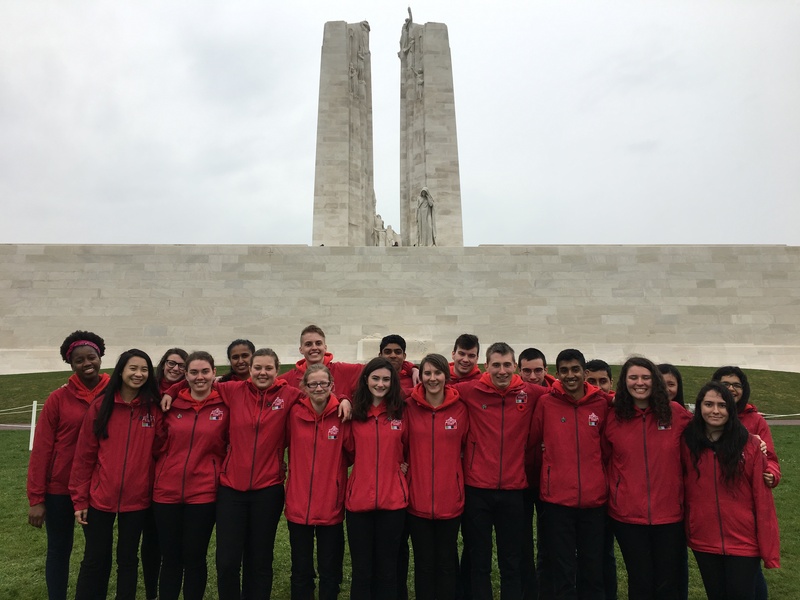 I am so happy to have felt the experience of everyone from around the world coming to Vimy and having been lucky enough to meet. [1:37 pm] Stephanie: Though stone littered the floor, rusted nails stuck out from the walls, and grenades lay idle on the ground, emerging from the dark tunnels of Maison Blanche was the art, personality, and stories of generations. [1:42 pm] Jeriann: I had an amazing time seeing all of the soldiers’ and miners’ graffiti in the Maison Blanche tunnels. I was looking forward to this since the beginning of the program, and it has exceeded all of my expectations. [2:14 pm] Thomas: D’ici quelques minutes, j’irai lire la promesse de se souvenir; quelle honneur ! [2:49 pm] Shakil: Staying outside in the rain, preparing to lay the wreath, the only thing running through my mind is the endless cold and rain that a soldier of the First World War had to go through. [4:13 pm] Kiana: The Vimy Ceremony was a very meaningful experience. It was beautiful and I feel like everything that I felt, learned, experienced and saw all culminated in that procession. I have never felt prouder to be Canadian. [4:17 pm] Laurissa: Je n’ai jamais vue une cérémonie de souvenir aussi grande et émouvante. Je suis très chanceuse d’avoir eu la chance de voir une telle cérémonie, et je m’en rappellerai toujours. [4:47 pm] Nepur: Reading the Commitment to Remember, I was proud and humbled to play a part in the ceremony and do my part to honour the contributions and sacrifices of Canadian soldiers. [5:24 pm] Katie: The world is a pretty small place… and sometimes you have to go to the other side of the globe to realize it. I was one of the three, along with Shaq and Stephanie, to lay a wreath at the Vimy Memorial. After hearing my last name announced, Barry C. Quinn (Justice of the Peace of Ontario) came to talk to me. It was quite an experience. [5:42 pm] Julia: Getting to see my great-grandfather’s cousin in the Aix-Noulette Cemetery was an amazing, emotional, and life-changing experience. [6:01 pm] Markus: I gained a new perspective on the importance of honouring our soldiers’ sacrifice and bringing their message to the modern world. [9:04 pm] Damien: Le programme a pris tout son sens aujourd’hui, quand le mémorial de Vimy s’est dévoilé à nous, sous la pluie et la brume, comme hors du temps, une vision irréelle qui nous a rappelé que tout ce que nous avons fait lors de la dernière semaine nous ramène finamelemtn à ce pourquoi nous nous sommes engagés dans cette aventure au départ: c’est vraiment un pèlerinage, pour Vimy, vers Vimy. [9:14 pm] Léa-Jade: Un mot : Reconnaissant ! Through today’s sites, I truly understood the weight of the sacrifices of the men and women who died serving our country. Around Notre-Dame-de-Lorette, 44,000 French are buried in what seems like infinite rows of crosses. I could not comprehend how so many people could be buried in this cemetery alone. Reading the statistics in a history textbook or on a website always allowed me to distance myself. However, walking past thousands and thousands of crosses and still seeing so many more stunned me. 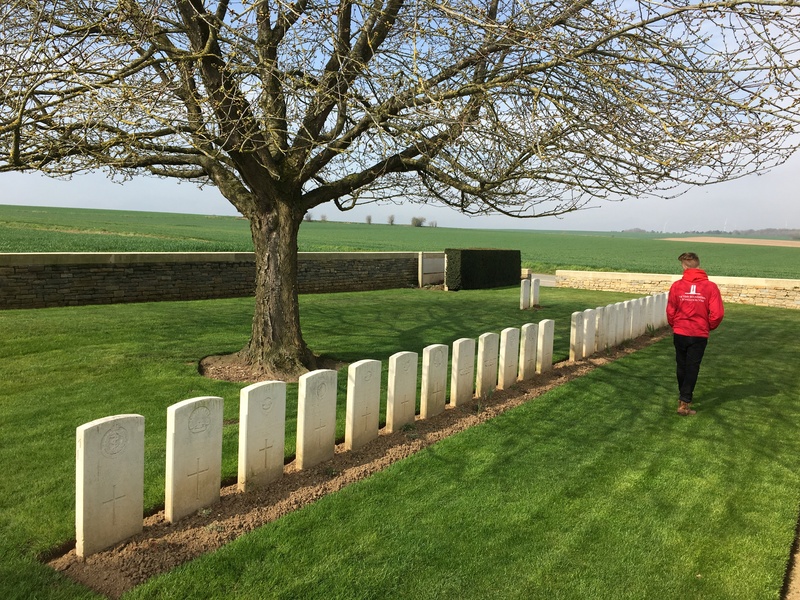 Visiting the largest French cemetery of the First World War allowed me to visualize the immense loss of human life in ways that I could not before the VPA program. I also had the opportunity to present my research on the first Canadian nursing sister to be killed in action during the First World War, Katherine Maud MacDonald. I have a lot in common with her: she was born in my hometown, graduated from my high school, and entered the medical field like I hope to next year. While it is extremely important to remember our soldiers who fought and died, it is just as important to remember Canada’s nursing sisters who fought to save them and died beside them. Finding MacDonald’s name and taking the time to honour her was one of the countless highlights of the program and one of many memories I will never forget. Les rangs de tombes s’enchaînent comme les salles d’artillerie qui a amené plusieurs hommes à leur repos éternel. Les tombes défilent à une vitesse effrayante, comme les pointes qui ont perforé leur coeur et celui de leur famille. En voyant ces rangées de grandes pierres blanches Lourdes de sens se tiennent fièrement au-dessus du corps inanimé d’un mari, d’un frère ou d’un fils. J’ai réalisé bien qu’en visitant un cimetière ou un musée du premier conflit mondial vous réaliser à quell point point les soldats ont sourffert, mais vous réalisr aussie que des familled, des enfants et des femmes aiment ces hommes tombés au combat. Non seulement ce terrible conflit a été terrible pour les soldats eux-mêmes, mais aussi pour leur famille. Nous n’avons pas oublié et nous n’oublierons pas que la mémoire de leur sacrifice vive à jamais dans nos coeur et dans notre mémoire collective. We are nearing the end of our wonderful journey. But as the quote goes, “Don’t be sad because it ended, be happy because it happened.” So today I am going to reflect upon my experience here in Europe with 19 other students and 5 amazing chaperones. We’ve come a long way! 6 days ago, when we all arrived at the airport in Montreal, no one knew one another. In a short period of time, however, we became a very tightly knit group. When I think of this program many years from now, I’ll think of the many wonderful places we visited. My favourite, thus far, has been the German cemetery in Belgium. It’s beautiful to think that even though the Germans were seen as the ‘enemy’ for invading their country, both sides had a mutual sense of respect for the burial of all the soldiers that fought. I am looking forward to the Vimy Memorial tomorrow, where I will be presenting my soldier. I’ve learned a lot about the Battle of Vimy Ridge in school, but I am happy to finally see the Memorial for myself. I am not related to Frank Cyril Pye. I do not come from the same hometown. We did not share school hallways. However, as I faced his headstone, I felt as if I was visiting someone I knew personally. While Private Frank Cyril Pye fought on the Front lines of France, he joked with his young sister back in Manitoba about her boyfriend. When his best friend was reported killed, he asked his sister to send over sheet music for another friend who was a great singer. Beneath the headstone, was the kind big brother who had nothing left but 24 letters addressed to his little sister. My tribute to Pye simply focused on things he said in his letters that I could relate to my own life. It didn’t matter what awards he won, what rank he was, or whether he enlisted or was conscripted. The importance was him being a real person with a real story. Though it is hard to comprehend the millions of interesting stories, big dreams, and bright hopes that were lost during the First World War, I began to understand the loss of a single life through Frank Cyril Pye. Today we visited the grave of the first Victoria Cross recipient and the last, the latter also being the soldier I researched for this program. Going to his grave and thanking him for his service was a really touching experience. It was a chance for me to connect with myself, to see what kind of person I really am and to observe my actions in this situation. Learning the story of a soldier really helped me to understand the gravity of ten million casualties in a meaningful way. We also went to a cemetery where there were British and German graves beside one another. What I found so interesting and inspiring was the difference between German graves and Commonwealth War Graves Commission graces. When visiting Commonwealth cemeteries, German graves were typically a similar shape, size, and colour, except for the top of the headstone, which was flat instead of rounded. In the St. Symphorien cemetery, however, I felt that the headstones were much more personalized, signifying a time where I felt where the soldiers had put their grudges aside. I am so fortunate to be part of this experience- I would recommend it to anyone thinking about it. Blanc, avec un haut courbé, aujourd’hui, j’ai vue une pierre tombale unique. Le soldat qu’elle commémorait est inconnu, il était « known unto God ». Depuis le début du programme, j’ai découvert qu’il y a beaucoup trop de pierres tombales comme cela. Ça m’a rendu vraiment triste et m’inonde d’émotions à chaque visite au cimetières. Selon moi, le mot souvenir me fait penser à un nom, un visage et une histoire. Quand je pense au soldats morts qui ont perdu leur nom et leur vécu au horreurs de la guerre, je ne peut pas m’en souvenir de la même manière. Ces soldats ont battu sur les meme champs de batailles et ont vécu dans les memes tranchées que tous les autres soldats. ils sont mort de la meme guerre, donc, je trouve qu’ils méritent rien de moins que leurs pair. Il faut apprendre à se souvenir de tous nos soldats, même nos soldats sans noms. Faire parti du programme PPV m’apprend comment je peut rendre hommage a tout les morts de la guerre. J’apprécie beaucoup la chance que j’ai d’etre içi a Vimy; pour tout nos soldats, connu de nos jours ou non. 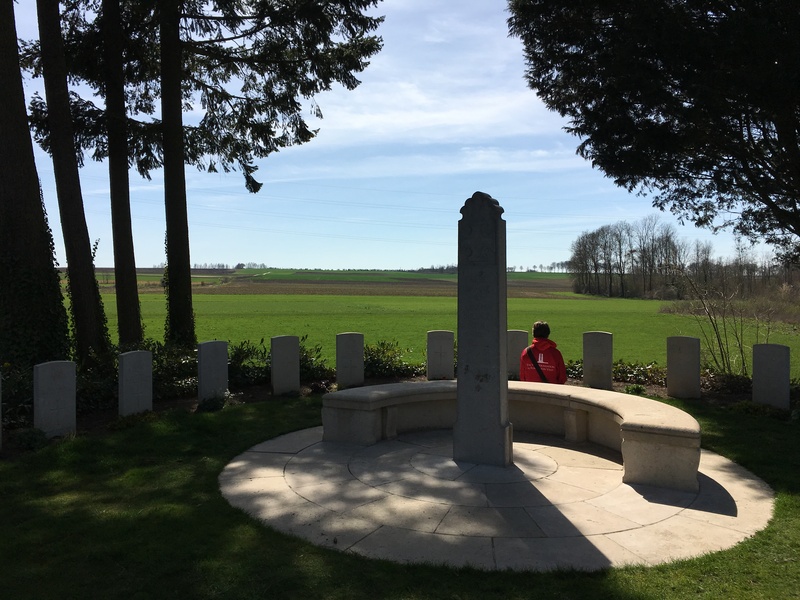 Visiting multiple cemeteries over the course of the Vimy Pilgrimage Award Program, I have come to notice many different aspects of the design and layouts of the resting places for many of the soldiers who fought in the First World War. One of the main aspects of the cemeteries is the size of the tombstones which are placed on the graves of every soldier. Whether or not the soldier is unidentifiable, was as low as a Private, or was one of the highest-ranking officers, they all received the same size tombstone. This has interested me throughout the entire program and it conveys and important message about how we value a human life. We visited another cemetery today, and the German graves where different sizes, separated by their rankings and how much money they had. If the family had a lot of money, they could pay for a larger tombstone, whereas in the Commonwealth countries, all the sizes are the same, but the family can pay for epitaphs which are extra. This poses the question of how we value the human life. In the cemeteries, the graves weren’t separated by the ranking either. A corporal could be buried right next to a low ranking private, just to show that all the lives are equal and that everyone who gave their lives for our freedom where all valued and never forgotten. Si un mot pouvait décrire mon expérience aujourd’hui, parmi les nombreuses expériences menées par notre guide Lucas dans une multitude de lieux historiques, ce mot serait : la quantification. Malgré les informations captivantes et les descriptions de symboles frappants, celles qui suscitèrent mes réflexions les plus profondes reposaient sur la quantification de la guerre. Que ce soit l’exploration d’immenses cimetières, de charnières ou de lieux de commémoration, j’ai pu appréhender une minuscule fraction des pertes monétaires, matérielles, et humaines, subies par les nations et les familles, une portion d’un bassin incompréhensiblement gargantuesque qu’aucun être ne peut concevoir. C’est là où j’ai découvert mon objectif pour cette expérience : de comprendre l’ampleur de la souffrance, du sacrifice et de la perte vécue par l’innombrable montant de soldats canadiens et de toutes autres nations lors de la Grande guerre. A common theme among those who have visited First World War gravesites is a feeling of intense curiosity and profound impact. This has been 100% true for myself. One detail that has struck me in particular is the way that the opposing sides have honoured the fallen of their “enemies.” With the benefit of hindsight, we can see that all soldiers, regardless of their alliance, were just men trying to get themselves through a horrific time. So, when I see the striking difference between the headstones of the German soldier as opposed to the British, Canadian, or Australian, I can’t help but wonder if there is an absence of respect for the German sacrifice. For commonwealth soldiers, the headstones are marble and rounded. Their German counterparts are square and flat, of other material, and do not appear to hold cemetery/memorial references. It could simply be a reflection of the difference in funerary customs. The contrast itself was made very apparent to me after we went to Langemark cemetery. The German cemetery was far more somber, has a far different atmosphere. The Commonwealth cemeteries hold resemblances to English gardens and give off an air of victory. Meanwhile, the German cemetery is covered in Oak trees, and hold many ties to the afterlife. So, while I question the difference to make such a blatant differentiation of tombstones, as long as we commemorate and acknowledge those fallen, we are moving in the right direction. Aujourd’hui a été une journée difficile émotionnellement pour moi. Dans une matinée grisonnante, nous sommes allés dans un cimetière de soldats allemands. Nous y avons appris que contrairement aux cimetières typiquement britanniques, plusieurs soldats étaient enterrés sous la même pierre tombale. J’ai trouvé ce concept intéressant car les britanniques font le contraire en essayant le plus possible d’avoir une pierre tombale pour un seul soldat. Depuis le début du programme, nous avons seulement visité des cimetières des Alliés, alors en voir un allemand m’a fait voir le massacre que la guerre à créer d’une manière différente, du côté des allemands. Aussi, il y avait dans ce cimetière plusieurs subtiles sens, chaque petit trait avait une histoire derrière son sens propre. Par exemple, on nous a expliquer que les arbres là voulaient démontrer la vie éternelle. J’ai trouvé cela incroyable que de si petites choses pouvaient avoir autant de sens dans cet endroit. De plus, dans ce cimetière, il y avait des statuts de simples soldats sans leurs chapeaux regardent au sol là où environ vingt-cinq mille soldats étaient enterrés, comme s’ils assistaient aux funérailles de ceux-ci. J’ai vraiment aimé cette touche de commémoration et cela m’as fait réaliser la difficulté de devoir enterré quelqu’un que l’on connait, ce que les soldats des armés ont dû faire chaque jour. “To live in hearts we leave behind is not to die.” This was quote on a headstone at the first of a number of different graveyards we visited today, Essex Farm. It was one of many things I saw today that touched me. Walking amongst the countless graves was both an emotional experience, and one that peaked curiosity and interest. Something that sparked that curiosity in me was the grave of William Ellis, who was part of something I had never heard of before; the Army Cyclist Corps. It was interesting to learn that a bicycle regiment had ever existed, it was something I had never heard about! On a day of such strong emotion, between the gravesites, and the touching ceremony at Menin Gate, there were also moments of levity, like lunch and bus rides with new friends, and some delicious Belgian waffles. This program is proving to be everything I had hoped. It’s challenging, fun, interesting, but most of all, very, very meaningful. I keep on trying to make connections between what we see in museums, cemeteries and representations of the First World War and their reflections or preservation in the beautiful scenery and architecture that surrounds me. I knew that at least 60,000 Canadians and tens of millions of soldiers from around the world were killed in the Great War, but walking past one headstone, after another, and another with hundred-year old soldiers buried right beneath me caused me to understand and picture the extensive loses and the reality of the war. The artillery and shelling on the front lines did so much damage that as many as eight soldiers’ head stones can be placed right next to one other, to show that those eight bodies were found mangled together – too mangled to be told apart or separated. The horrific situations these soldiers endured certainly deserves all the commemoration they have been given and much more. As I continue on this journey, I will continue to wonder how much of the land was once a battleground and commemorate those who would have stood there before me. Damien: Damien: Le moment fort de cette journée a été la cérémonie du Last Post, à la Porte de Menin à Ypres. J’ai eu la chance d’y participer avec deux camarades, en allant porter une couronne de fleurs sur le monument. Ce fut un moment très émouvant, tout d’abord en raison de la nature du monument. Il comméorait tous les morts non retrouvés dans la région d’Ypres lors de la guerre. C’était incroyable de constater qu’autant de soldats n’auront probablement jamais droit à une vraie tombe. Cependant, malgré la tristesses du lieu, ce fut très beau de voir qu’autant de gens se sont déplacés pour une cérémonie quotidienne. Je pense donc que nous sommes capables de nous souvenir du sacrifice de ces soldats à jamais, si nous y mettons les efforts nécessaires. Today we visited several Commonwealth War Graves Commission cemeteries. At each cemetery we spent a few minutes wandering and looking at the gravestones. I found that seeing the names was extremely powerful because although I knew that there were millions of casualties in the First World War, I was never really able to grasp exactly how each one of those people had a life and a family that they left behind, and how much the war really affected everyone, even those who weren’t soldiers. Another part of the cemetery visits that really touched me was the graves that read “A Soldier of the Great War”. There were dozens of such graves in every cemetery, and it seems awful that these people never really had a physical grave where they could be honoured and their families could mourn, especially after they gave their lives for their country. Overall, I found that visiting some cemeteries helped me understand on a deeper level some of the impacts of the First World War in a way that statistics from textbooks never could. The tolling bells evoked the same emotions in me as they did over one hundred years ago for the residents of Ypres. These bells comprise the Cloth Tower whose bells ring out multiple times an hour. The citizens were subjected to the same sequence of bells, that not too long before the war, signified a funeral. The system suddenly sprang to life with a deafening clanging, forcing those of us standing directly next to it into a sort of stupor. This short loss of self-awareness was followed by a greater comprehension of how the war impacted those whose homes lay on the front lines. The church’s current bells date from the 1930s; the originals were destroyed by German shelling during the war. This brought to light how devastating the four-year stalemate at Ypres was on the lives of those who lived there. Today we went to the In Flanders Fields Museum. One of the exhibits was a film of actors pretending to be doctors and nurses from at the front lines of the FWW telling their side of the story. One thing that they said that struck me because I had never seen it that way before was that they said it is just as harmful for the watchers as for the dying. I think we often focus on the horrible effects of the war especially focusing on casualties of soldiers, but there was a major impact on those assisting on the battlefields as well. The actor playing a doctor was telling how he would be performing surgeries from six in the morning till two the next morning, have a short break for sleep, then keep going. The things that they saw permanently changed them. We need to remember all the heroes of the FWW, including the ones behind the scenes. I am so thankful for the opportunity to gain a totally new perspective on various aspects of the FWW, and am sure this will be a regular occurrence every day during the program. Ma première journée avec ce programme été très enrichissante et m’a beaucoup éduquée. Nous sommes arrivés en Belgique, nous étions tous très fatigués, mais j’avais quand même vraiment hâte. La première activité qui nous avons fait, et je m’en souviendrai toujours, c’est quand nous avons marchés vers la Cloth Tower. On nous avait dit que tous les monuments qui entouraient cette merveille avaient été détruits lors de la Première Guerre Mondiale, pourtant, je ne voyais aucune maison endommagée, c’est comme s’ils avaient reconstruit la ville comme elle l’était avant. En marchant, j’ai pensé au fait que nous (les différents pays qui ont participés à la guerre) avons tous vécus les horreurs de la guerre de différentes manières. Au Canada, on n’avait pas peur de perdre nos terres, nos fermes, on ne faisait qu’envoyer les soldats dans d’autres pays… Ici, en Belgique, ils ont tous perdus, incluant leurs maisons, leur chez-soi. Pourtant, une décennie plus tard et à travers tous ces difficultés, la ville est tout de même vibrante et belle. Une brique à la fois, ils ont tous reconstruit. Aujourd’hui, j’ai surtout pensé à la force des citoyens de villes qui « vivent » réellement la guerre et qui la voient au quotidien. 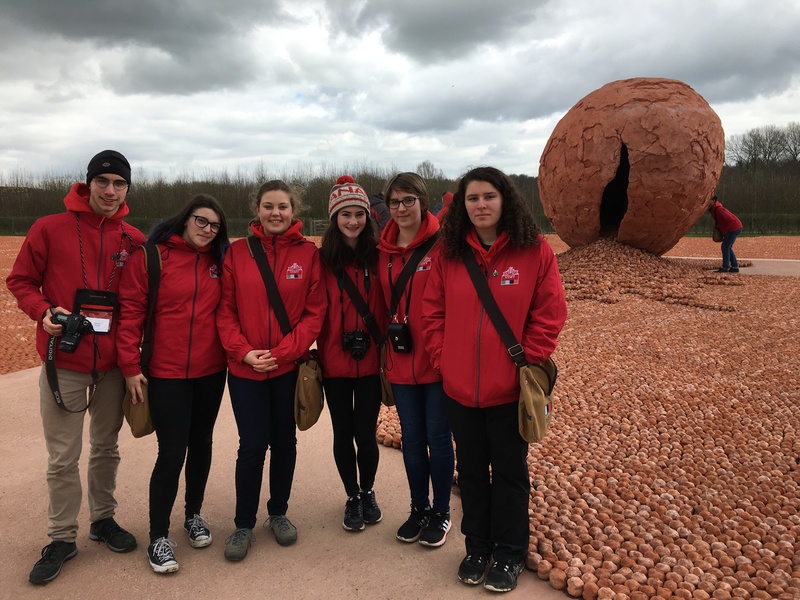 Nos récipiendaires du Prix du Pèlerinage de Vimy de 2018 ont embarqué pour un programme pédagogique d’immersion en Belgique et en France, afin d’étudier l’histoire du Canada durant la Première Guerre mondiale. Suivez les élèves alors qu’ils blogent sur leur expérience! (À noter: les participants blogueront dans leur langue maternelle.) Les blogs d’aujourd’hui viennent de nos chaperons. Everyone made it to Montreal! Of all the logistics involved in the VPA, this is the one I was the most nervous about. With it being early April and having people fly in from across the country, the possibility of an infamous spring snow storm always lingered in my mind. Now that that is no longer a possibility, I’m really looking forward to getting the program started. I’ve always loved active learning and getting students outside the classroom as much as possible, and the VPA is an incredible example of that. 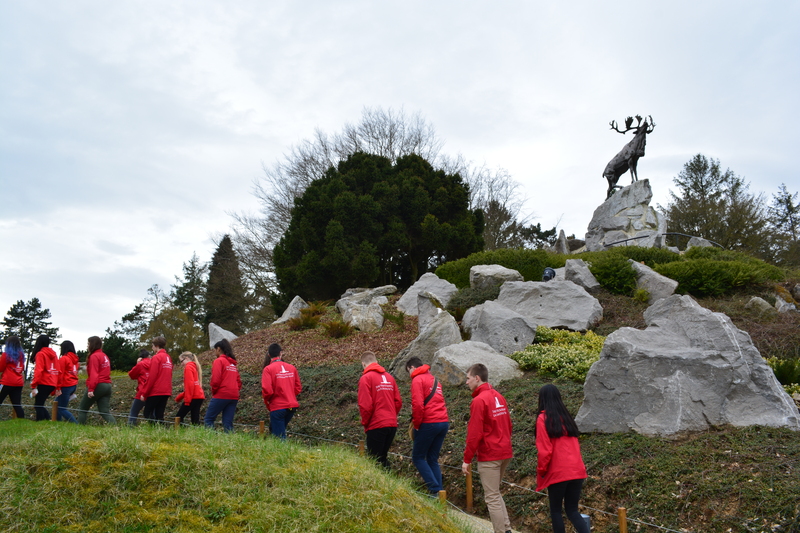 The opportunity to visit the various sites and have them tell the story of the First World War is a great opportunity for not only the students, but also us chaperones. I have arrived safely in Brussels and am looking forward to meeting the students and my fellow chaperones! We have a busy and exciting week ahead of us, and I can’t wait to start sharing critical thinking skills with this year’s VPA recipients. Being the only non-Canadian this year, I am also hoping to learn a bit more about Canadian culture from our students. It’s going to be a lovely and educational programme, and we’ll go over different historical sources such as sites, material culture and literature, and hopefully the students will be equipped to pass the knowledge they gain forward onto their fellow Canadians. After much anticipation, we are finally all together. Everyone has arrived at the airport and I can’t express enough how excited I am to embark on this journey with such a fantastic group of students and chaperones. This is my first year on the VPA program and I’m really looking forward to the wonderful experience we will all share. The day is finally here! 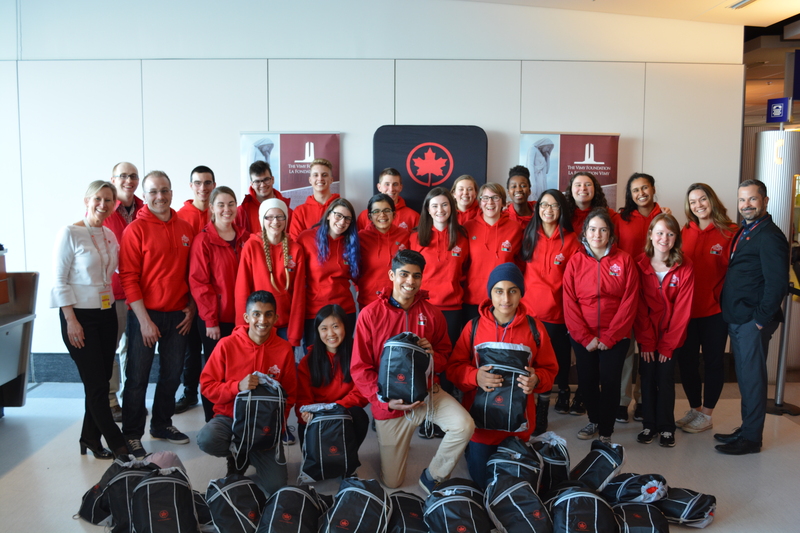 The students and chaperones all met up at the airport in Montreal and are heading overseas for the Vimy Pilgrimage Award program. 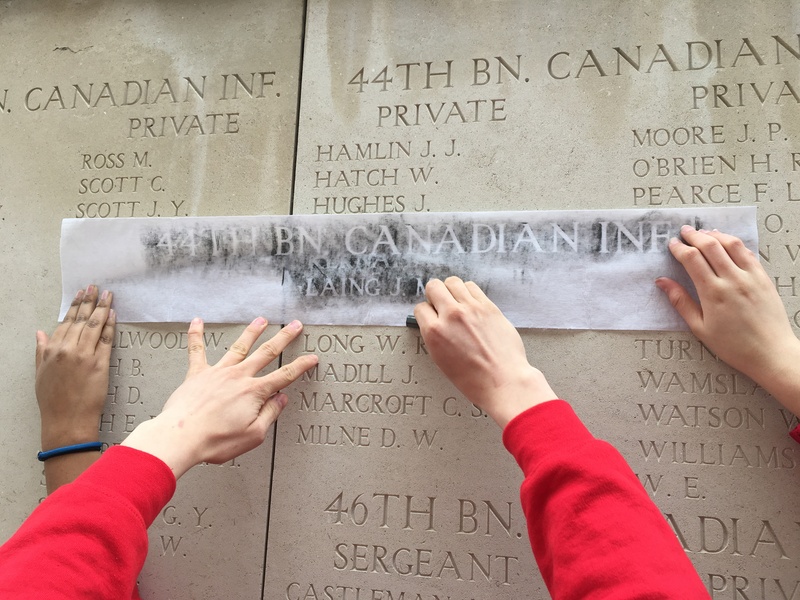 We have a full itinerary that begins as soon as we arrive in Ypres in order to make the most of our time in Europe – starting with the In Flanders Fields museum in the Cloth Hall. 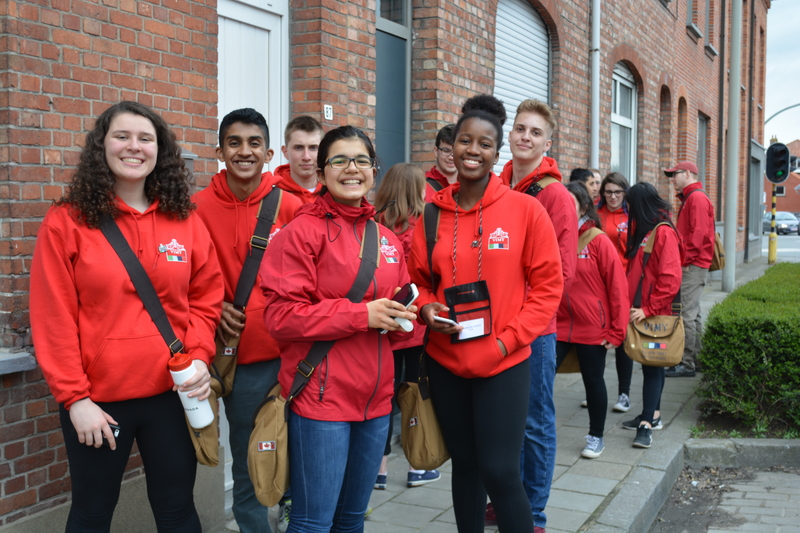 I look forward to getting to know the students and sharing such an incredible experience on the Canadian battlefields in France and Belgium! I am so thrilled to be meeting everyone and hearing about what has brought them on this amazing journey to Vimy. I know that we have come from all across Canada with very different stories to share and I look forward to hearing about each and every single one. It maybe be a long day for some of us but I believe it will be a great day and a great start to the experience of a life time.